Breville BES840BSXL The Infuser Espresso Machine, Black Sesame is currently selling at $460.19, approximately $0.39 lower than average, giving a potential saving of $4.80 right now. With a lowest price of $445.04 and an average of $460.58 it is selling on the high end of its usual range. Price volatility is 26.6% (meaning it changes all the time), so the price will most likely drop in the next few hours. Right now this product is a recommended 'ok deal'. 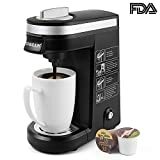 Compare the current price, savings (in dollars & percent) and Buy Ratings for the top Espresso Machines that are closely related to Breville BES840BSXL The Infuser Espresso Machine, Black Sesame. Here is how Breville BES840BSXL The Infuser Espresso Machine, Black Sesame compares with other leading Espresso Machines. Included dual wall filters provide excellent practice for budding baristas Well-balanced espresso depends on an even extraction from the espresso grounds. Included single wall filters provide a more challenging experience for those who have already mastered the art of espresso Why the Breville BES840BSXL Infuser Espresso Machine? The 61 fl. oz. (1.8 L) removable water tank is a top-fill tank with a handle. It has a replaceable water filter to reduce impurities and scale. The 1600W thermocoil heating system circulates the water through a heated coil, heating water ‘on demand’ for better temperature consistency. It also uses PID technology to regulate the temperature. A 54mm stainless steel portafilter with commercial style spouts and a 54mm tamper are also included for expert tamping control. The tamper is stored magnetically on the machine, but is easily removable for tamping. The dry puck feature removes excess water from the ground coffee in the filter basket for easy disposal of the coffee puck. The espresso pressure gauge helps you monitor espresso extraction pressure, so you know whether the espresso is being over- or under-extracted. The volumetric control functionlets you set shot volumes. Use either the preset volumes or manually over-ride them with your own preferences. Once you figure out what volumes you prefer, you can program it to remain at your customized setting. The dedicated outlet for instant hot water (for making Americanos, hot chocolate, and for warming cups). 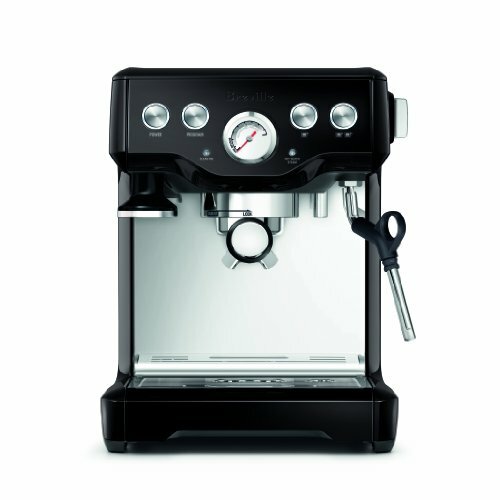 The steam wand is used for effortless milk frothing for making lattes and cappuccinos. It is made of stainless steel and swivels 360 degrees to accommodate different size frothing jugs. The auto purge function automatically adjusts the temperature of the water used for steaming milk and extracting espresso. The function automatically begins to cool the boiler to the optimal temperature for espresso extraction after using the steam wand. The removable drip tray is partitioned for both wet and dry spills, with an 'Empty me!' indicator for when it’s full.